Eye-ctaching design and a relatively recent breakthough. Surely someone knows whose idea it was to rid football boots of laces? 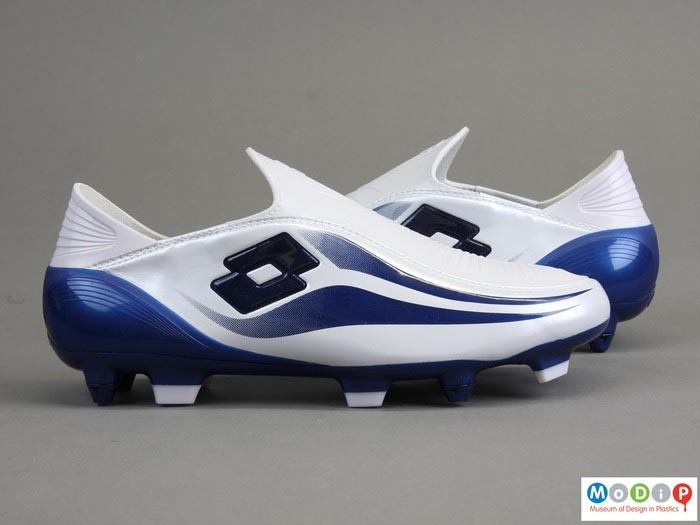 A pair of white and blue Lotto Zhero Gravity football boots. They come with an accessories pack including spare studs (12 in total in three different sizes), a special stud key which doubles as a shoe horn and 2 pairs of interchangeable insoles (one pair already in the shoe). These were the first laceless football boots to be manufactured. Dimensions length 270 mm, width 90 mm, depth 120 mm. Zhero Gravity football boots: AIBDC : 005768 No laces so how do they stay on and whose idea was it? But it would appear they were first marketed in 2006. Really useful websites, Rupert, thank you - and this link: http://www.zherogravity.lottosport.com/en/less-is-more shows the whole family of shoes from 2003. What we are looking for is the designer but is that becoming an outmoded concept? Clearly these are designed by a team and the team is the Lotto Zhero Gravity team. Perhaps we need to be satified with that rather than finding the individuals from which it is formed. Any comments? Let's drop them a line. Email sent to Zhero Gravity on 26/03/2014 but no reply to date. Submitted by Susan Lambert on Wed, 05/03/2014 - 16:09. We are looking for who designed these football boots. Can you help?